Bhutan Travel Package from Singapore... Get 30% Off including Visa fee! 5 Days Bhutan Tour Package from Singapore will lead you experience the mystical Western valleys of Bhutan is an ideal introduction to the Dragon Kingdom. Experience Bhutanese hospitality, admire the ever-changing landscapes, and immerse yourself in Bhutan’s rich Buddhist culture. The best recommendation Bhutan tour for Singaporean if you wish to travel to Bhutan. The flight route connects directly from Singapore to Paro via Kolkata/Delhi (India). The 5 days Bhutan tour will let you experience the beauty and preserved culture till today in Bhutan. We will arrange all your Bhutan visa permits before your trip to Bhutan. If you wish you can customize your tour adding short hiking tours which includes Khamsum Yella Temple in Punakha and Tango Cheri Monastery in Thimphu making your trip to Bhutan best of it. Some of the tour highlights will include visiting Ta Dzong Museum, Rimpong Dzong with its wooden cantilevered bridge and the infamous Taktsang Monastery (Tiger’s Nest) in the beautiful Paro Valley, The National Memorial Chorten, 12th century Changangkha Temple and the National Library exhibiting ancient scriptures in Bhutan’s capital Thimphu, and after crossing the 3050m Dochula Pass with spectacular Himalayan views, a journey into the sub-tropical Punakha Valley featuring the incredible the Punakha Dzong and Chimi Lhakang, temple of the ‘Divine Madman’. 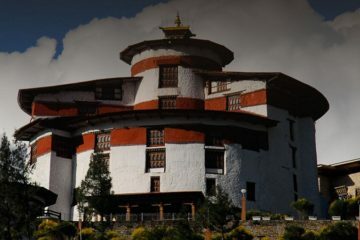 View our 5 Days Bhutan travel plan itinerary for Singaporean in Google Map. On arrival, guests will be received at the airport by our representative who will be your tour guide and companion for the whole duration of your tour in Bhutan. Drive to your hotel in Thimphu. Today we will be exploring more places visiting Handmade Paper Factory, Folk Heritage Museum, Memorial Chorten and Changangkha Lhakhang. Later evening we will drive to Punakha. Evening, you can explore some handicrafts shops nearby town. Morning we will be drive to Khamsum Yulley Namgyal Chorten, 45 minutes hike and while return visit Chimi Lhakhang. After lunch, will continue with Nalanda Buddhist College, Punakha Dzong and Bhutan`s largest suspension bridge. Later evening drive back to Paro. Early morning after breakfast, we will hike to Tiger`s Nest. We will have our lunch at Taktshang Cafeteria. Afternoon, we will continue visiting Druk-yul Dzong, Kyichu Lhakhang, Ta-dzong and Rimpong Dzong if time permits. Our Tour to Bhutan was well organized and thanks to Tashi, who took care us through our entire trip to bhutan.